MK Zoabi, who was on the IHH flotilla, is at it again, testifying against Israel in South Africa tribunal. 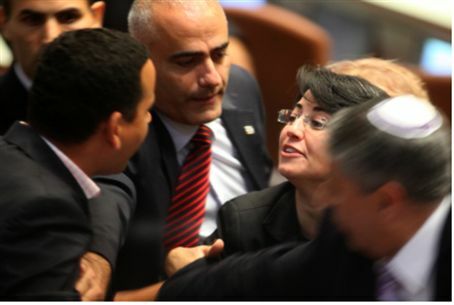 MK Hanin Zoabi (Balad) will face charges in the Knesset's Ethics Committee following her testimony against Israel in an ultra-leftist private tribunal in South Africa. Zouabi testified before the "Russell Tribunal on Palestine," and reportedly said: "From the get-go there was no justification for creating a Jewish state. Now that there are generations of Jews who were born in it, I want to live beside them but not in a racist Jewish state." MK Otniel Schneller (Kadima) filed a complaint to the Ethics Committee after he found that Zoabi did not request its permission for participating in the anti-Israel tribunal. "On 6.11.11 it was reported that MK Zoabi (Balad) testified against Israel in the Russell Tribunal in South Africa, and stated that Israel is an apartheid state and therefore should be hit with diplomatic, trade and cultural sanctions," he wrote in his complaint. "In a check I conducted, I discovered that MK Zoabi did not request the Ethics Committee's approval before flying abroad, as is mandated by the Knesset Rules of Procedure," wrote Schneller. "I would be thankful if the Committee looks into MK Zoabi's behavior regarding the trip's purpose, the financing elements and the protection that the law gives her as she carries out subversion against the State of Israel..."
Zoabi faced charges in the Ethics Committee after she participated in the violent Mavi Marmara flotilla. The Ethics Committee slapped her on the wrist for that event and is unlikely to do much more regarding her latest transgression. She has also assaulted a Knesset usher and apologized for it later. Openly making a laughing stock of Israel raises Arab MKs' "street cred" among their voters, and the MKs vie with each other over who will take more radically subversive steps against the State.